The title Bleu de ciel (Sky Blue) suggests that Wassily Kandinsky here privileges the ground over the biomorphic forms floating in space, granting special importance to this atmospheric blue, the blue of the sky seen from his studio. In this universe of brightly coloured, freely developed forms, only the painter’s monogram in the bottom left hand corner has anything of the rectilinear about it. 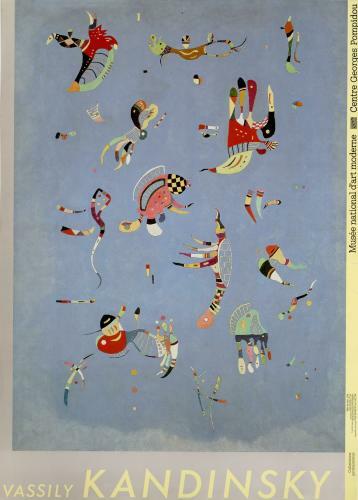 Inspired by an old tapestry discovered in Paris, the little creatures here give the painting an optimistic air, even though the German occupation had caused Kandinsky and his wife Nina to live withdrawn at their home in Neuilly.